Route: Longbridge, Birmingham to Hamilton, Scotland. Well what a fantastic LEJOG tour day. 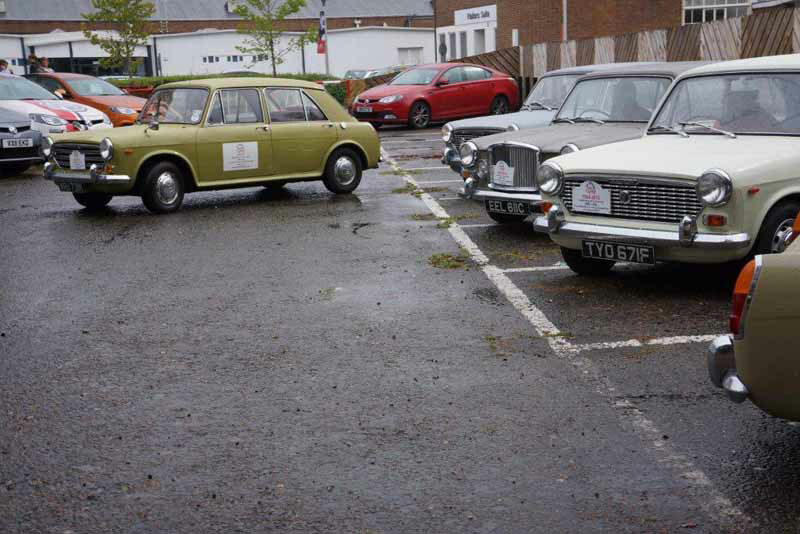 We were given the VIP Red carpet treatment at MG Longbridge and met by TV crews who wanted to cover our arrival WOW!!! A convoy tour of our marvellous cars was covered by ITN news and we certainly put on a superb display with the cars performing at their very best. The TV crews had us for an hour and instantly published on their websites and later on local and National TV!!!! Jose Ambel was the star of the show and interviewed over his amazing Innocenti. Being interviewed by any TV crew is daunting enough but when it's In a second language....... Well what can you say other than Jose is a natural and a TV superstar!!! We were treated to an exclusive MG plant tour which can simply be described as breathtaking and gave us a sneak preview of the new MG 3 which will be launched next year!! We were shown around Cecil Kimber's office and the production plant and the design offices of MG.
A very privileged tour and our thanks to MG for hosting us and giving us an exceptional tour. Some individuals did stay a little longer to test Drive the MG 6 and it looks like Alexander Boucke might have a new addition to the family!!! A daunting 300 mile journey to Glasgow awaited us after what can be described as a superb morning. As has become the norm our French cousins set the pace with Oliver Redaudin, Claude Thomas and TV superstar Jose Amber acting as pace leaders.......... If there was Olympic medals for 1100 speed these guys would win all three!!! Thankfully the sky was kind to us as the sun came out and we were not subjected to our normal treatment of floods, torrential rain and fords! Indeed our Journey was incident free with only Martin Williamson's MG reported as running slightly rich. But now I'm starting to think that our members are only reporting faults just to get a mention on the Web page!!!!!!! None, which leaves me as the editor to have an early night!!! 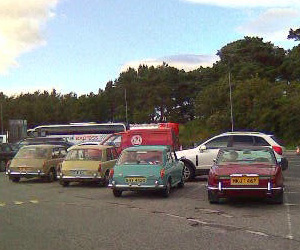 These cars have really proved today that even after 50 years of age and gruelling 300 miles that they are a great feat of British engineering, Sir Issigonis, Dr Moulton, the designers and the plant workers should be justifiably proud of this remarkable car which has had every driving environment thrown at it over the last 3-4 days. We continue to forge ahead with tomorrow seeing our journey through the Scottish Highlands and our arrival at JOG!! !